By the Way, Yesterday was April Fool’s Day. I Promise I’m NOT Quitting You. Or the Blog. 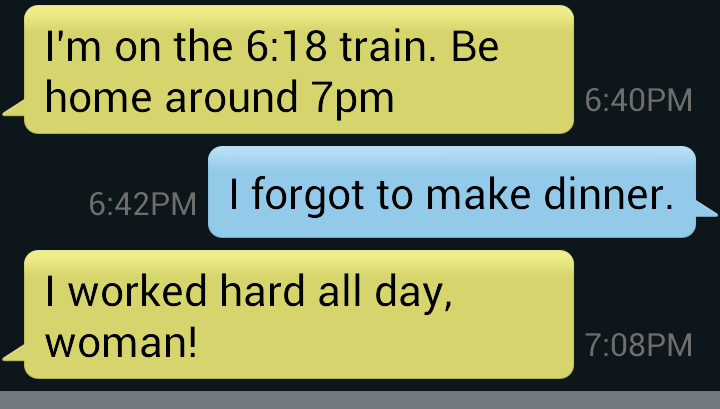 A conversation/interaction between me and B before getting on the train home. Me: Did you bring me snacks? Brian: Maaaaybe. I don’t remember. Maybe not. Me: What snacks did you bring? Brian: I think I forgot. Maybe there are some from last week. Me: That’s okay. I have cheese and cracker sticks. And jelly beans. Brian: There’s string cheese and apple juice too. Me: Best. Boyfriend. Ever. It’s like a real life after school snack. We have this textversation on the train. Before I worked in the city (3 days a week), Brian used to always let me know what train he was on, so I could plan dinner…sometimes. Brian: But it’s part of the wifely duties. Me: I don’t see a ring on my finger. I’m definitely not cooking you dinner. Blog friends, tell me something cute that your significant other does for you. I love adorkable tales, you know. PS: Thanks to all you lovelies who commented on my April Fool’s Joke. While I am not planning on quitting the blog, I really appreciated the support and suggestions. You guys are amazing. That is all.